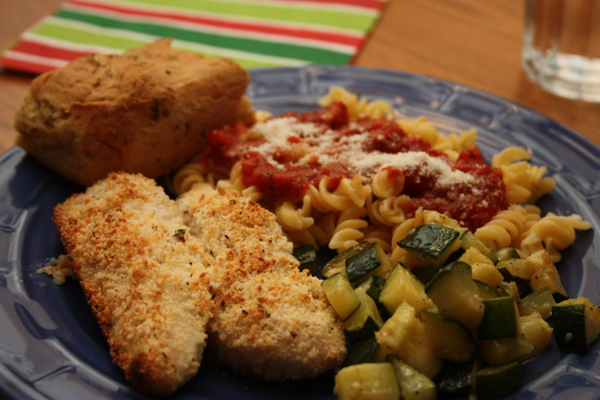 Need a quick and delicious meal? This dinner was super easy to put together and was ready in less then 30 minutes (if you exclude the marinating time). It also rated very high on Jeffrey’s new favorite list. I think it is a keeper. This week, I am leading the 1st and 2nd grade group in Vacation Bible School at our church. Therefore, dinners this week need to be super easy and fast. After a quick stop at Costco to buy some milk (to support my kids milk habit of 3 to 4 gallons a week) I decided to pick up some fish for supper. It cooks quickly and I was craving something light. 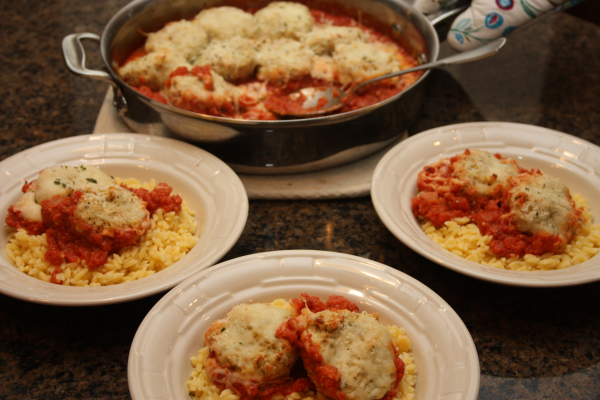 I was so pleased that I tried this new recipe and everyone enjoyed it. I cooked some orzo and just added a pat of butter with some salt and pepper and then chopped some spinach to mix in and it was the perfect side. This will definitely be a go to meal when I need something quick. In a large bowl or baking dish, combine olive oil, sesame oil, soy sauce, garlic, ginger, vinegar, brown sugar and whisk well until combined. Add salmon to the dish turn to coat, then refrigerate and marinate for 30 minutes. 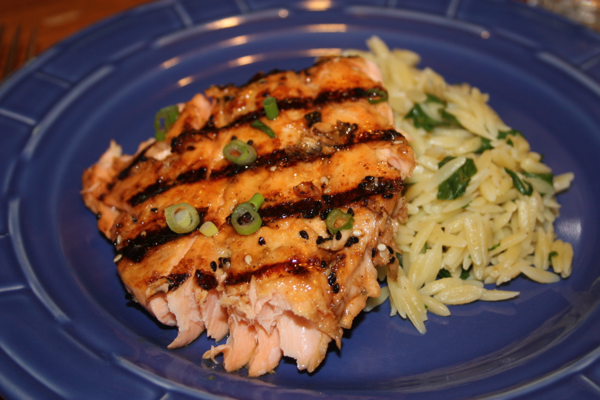 Remove salmon from the marinade and place on well oiled grill. (Make sure to spray or oil the grill or the salmon will stick.) Sprinkle with a little bit of salt and pepper. Cook for 5-6 minutes per side, depending on the salmon’s thickness, until opaque and easily flakable with a fork. 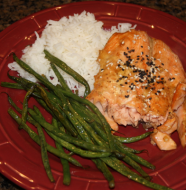 Remove and serve immediately, with a sprinkling of sesame seeds, green onions and the glaze below.